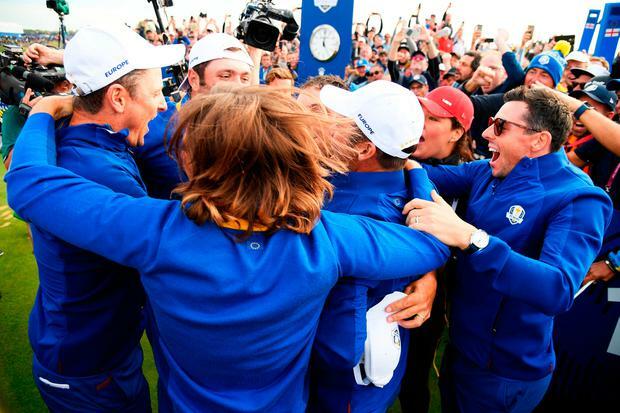 Francesco Molinari fittingly took the glory as Europe regained the Ryder Cup in dominant style, the Italian beating Phil Mickelson on the 16th to post the point needed to reach the magic tally of 14.5. Mickelson conceded the hole after firing his tee shot into the water with Molinari on the green to leave the Italian as the first European to win all five matches in a week - having not won any of his previous six. 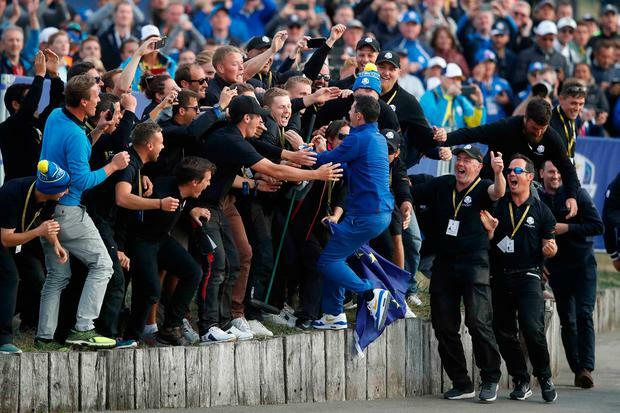 Europe were effectively already assured of victory when he teed off as the Italian, Henrik Stenson and Sergio Garcia were all dormie and guaranteed at least half a point from their games - with Europe at that stage needing one. They had started the day 10-6 up, needing to secure four and a half of the 12 points available to win back the trophy and extend their stranglehold on home soil that dates back to 1993. Only twice before had a team come from four down going into the singles to win -- the US doing so at Brookline in 1999 and Europe in 2012 in the 'Miracle of Medinah', but another stunning comeback never really looked on the cards. Team Europe's Jon Rahm (left) celebrates after Europe win the Ryder Cup during the Singles match on day three of the Ryder Cup at Le Golf National, Saint-Quentin-en-Yvelines, Paris. PRESS ASSOCIATION Photo. Picture date: Sunday September 30, 2018. See PA story GOLF Ryder. Photo credit should read: Adam Davy/PA Wire. RESTRICTIONS: Use subject to restrictions. Written editorial use only. No commercial use. Team Europe's Sergio Garcia (left) and Ian Poulter celebrate after Europe win the Ryder Cup during the Singles match on day three of the Ryder Cup at Le Golf National, Saint-Quentin-en-Yvelines, Paris. PRESS ASSOCIATION Photo. Picture date: Sunday September 30, 2018. See PA story GOLF Ryder. Photo credit should read: David Davies/PA Wire. RESTRICTIONS: Use subject to restrictions. Written editorial use only. No commercial use. Team Europe's Justin Rose takes a selfie with fans after his side win the Ryder Cup at Le Golf National, Saint-Quentin-en-Yvelines, Paris. PRESS ASSOCIATION Photo. Picture date: Sunday September 30, 2018. See PA story GOLF Ryder. Photo credit should read: Gareth Fuller/PA Wire. RESTRICTIONS: Use subject to restrictions. Written editorial use only. No commercial use. Team Europe's Tommy Fleetwood celebrates during the Singles match on day three of the Ryder Cup at Le Golf National, Saint-Quentin-en-Yvelines, Paris. PRESS ASSOCIATION Photo. Picture date: Sunday September 30, 2018. See PA story GOLF Ryder. Photo credit should read: Gareth Fuller/PA Wire. RESTRICTIONS: Use subject to restrictions. Written editorial use only. No commercial use. Team Europe's Rory McIlroy celebrates winning the Ryder Cup at Le Golf National, Saint-Quentin-en-Yvelines, Paris. PRESS ASSOCIATION Photo. Picture date: Sunday September 30, 2018. See PA story GOLF Ryder. Photo credit should read: David Davies/PA Wire. RESTRICTIONS: Use subject to restrictions. Written editorial use only. No commercial use. Team Europe's (top row, from the left to right) Henrik Stenson, Alex Noren, Sergio Garcia, captain Thomas Bjorn, Ian Poulter, Jon Rahm, Francesco Molinari (bottom row, from left to right) Justin Rose, Tommy Fleetwood, Tyrrell Hatton, Thorbjorn Olesen, Rory McIlroy and Paul Casey celebrate with the Ryder Cup on day three of the Ryder Cup at Le Golf National, Saint-Quentin-en-Yvelines, Paris. PRESS ASSOCIATION Photo. Picture date: Sunday September 30, 2018. See PA story GOLF Ryder. Photo credit should read: David Davies/PA Wire. RESTRICTIONS: Use subject to restrictions. Written editorial use only. No commercial use. Team Europe's Rory McIlroy (centre) celebrates during the Singles match on day three of the Ryder Cup at Le Golf National, Saint-Quentin-en-Yvelines, Paris. PRESS ASSOCIATION Photo. Picture date: Sunday September 30, 2018. See PA story GOLF Ryder. Photo credit should read: Gareth Fuller/PA Wire. RESTRICTIONS: Use subject to restrictions. Written editorial use only. No commercial use. Team Europe's (left-right) Paul Casey, Ian Poulter, Tommy Fleetwood and Justin Rose celebrate after the Singles match on day three of the Ryder Cup at Le Golf National, Saint-Quentin-en-Yvelines, Paris. PRESS ASSOCIATION Photo. Picture date: Sunday September 30, 2018. See PA story GOLF Ryder. Photo credit should read: David Davies/PA Wire. RESTRICTIONS: Use subject to restrictions. Written editorial use only. No commercial use. Team Europe celebrate with their wives, girlfriends and the Ryder Cup trophy on day three of the Ryder Cup at Le Golf National, Saint-Quentin-en-Yvelines, Paris. PRESS ASSOCIATION Photo. Picture date: Sunday September 30, 2018. See PA story GOLF Ryder. Photo credit should read: David Davies/PA Wire. RESTRICTIONS: Use subject to restrictions. Written editorial use only. No commercial use. Justin Thomas, Webb Simpson and Tony Finau gave Jim Furyk's team a glimmer of hope with early wins but then the European points started pouring in from all over the course. Thorbjorn Olesen hammered Jordan Spieth and fellow rookie Jon Rahm beat Tiger Woods -- leaving the 14-times major champion with a stunning four defeats out of four. Ian Poulter, "Mr Ryder Cup", then produced probably the loudest cheer of the week when world number one Dustin Johnson conceded on the 18th green to leave Europe on the verge. It was then just a question of which match out on the course would finish next and it proved to be Molinari's - sparking amazing scenes of celebration watched by the biggest galleries in the event's history. Molinari said: "It means so much, more than majors, more than anything. It's hard not to get emotional. "They had probably the strongest team ever and we were just so good, it is unreal. "I just tried to do things well and be professional. Today it was hard to get the energy but I stepped it up when I had to."